''Eve'' is a thought-provoking modern oil painting from Gordon Mitchell. 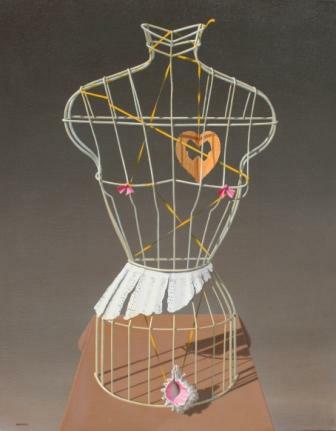 Full of quirky imagery juxtaposed within a wire frame human torso decorated with ribbon it could be regarded as surreal although Gordon describes himself as an ''abstract expressionist'', creating paintings that can be amusing at times, at others ironic. Described as one of the finest imaginative painters of his generation. Gordon Mitchell''s paintings display a balance and tonal harmony of a fine Scottish colourist. Artist Gordon Mitchell is one of a growing number of artists whose modern art works feature at Red Rag Gallery in Bath. Modern art work from Gordon Mitchell is regularly exhibited at the Bath art gallery which also offers an extensive choice of modern art, contemporary sculptures and collectible art prints from other present day artists. In addition to Red Rag Modern Art Gallery Gordon Mitchell has exhibited at other leading Scottish Art Galleries and he has won numerous awards. Each painting at Red Rag is sourced from the Gordon Mitchell artist studio and like all Red Rag British art and Modern art it can be shipped worldwide. . Gordon Mitchell Limited Edition Prints are also available from Red Rag Gallery. Click here to view more contemporary paintings by Gordon MITCHELL.